If you’re competing with other Amazon sellers that sell your product, the key to capturing market share and growing your sales is winning the Buy Box. According to Statista, 82% of all Amazon purchases come through sellers that won the Buy Box at the time of purchase. If you’re not winning the Buy Box, it doesn’t mean customers can’t purchase from you, it just means you’re far less likely to get the sale. The Buy Box is the big add to cart button on a product detail page which customers can click on to begin the purchasing process. Only one seller at a time can win the Buy Box, but Amazon rotates the Buy Box between different sellers, so that one particular seller can’t win the Buy Box 100% of the time. However, the top sellers are able to achieve a very high Buy Box percent of between 95% and 99%. For more details on these 5 factors, watch our Buy Box Video on our YouTube channel, Effective on Amazon. Ok, ok. This tip seems obvious. BUT, don’t assume that once you get your Buy Box up to 99% you can stop worrying about it. A competitor can come along at any time to unseat you. Tracking your Buy Box percent and reviewing it every day can help you spot a major issue right away. 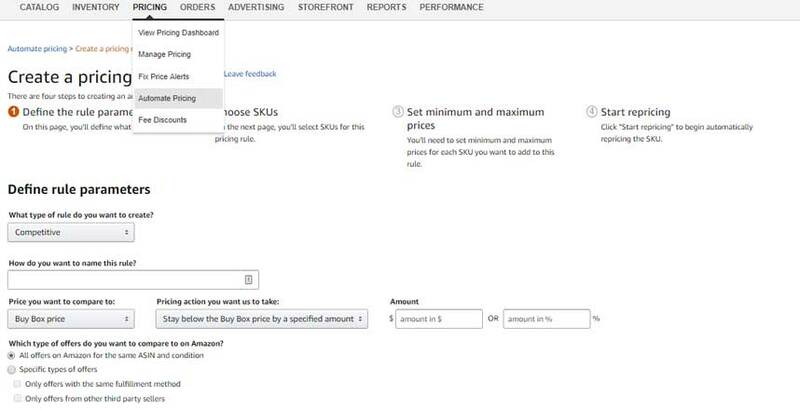 To track your Buy Box %, visit the Business Reports Section by going to Reports > Business Reports > By ASIN: Detail Page Sales and Traffic.This report will have a column to show the percentage of time you win the buy box on each SKU. Amazon’s automated pricing tool helps you ensure your products are priced competitively. This tool is especially helpful if you’re selling hundreds of different products that are competing for the buy box or if you have a lot of different competing sellers for your product. To find this tool, look under the Pricing menu in Seller Central, where you’ll find the “Automate Pricing” tab. You can set up rules for each SKU to automatically change prices based on what your competitors are doing. For example, you can set a rule to change your price to match or come in lower than the Buy Box price by a certain percentage or dollar amount. The pricing rule can also be set up to stop adjusting at a certain minimum or maximum so you don’t sell product at a loss. For instance, if you could set your minimum price to where you make $1 and set your maximum at a price where you make $100 (max price from my experience doesn’t matter as much as the minimum). Then, you could set your pricing rule to stay below the Buy Box price by $1 so you can almost always stay at the lowest possible price point and still win the Buy Box. As you already know, fulfillment speed is a key factor that influences your Buy Box %. Fulfillment speed includes both handling and shipping time. In other words, it’s the time it takes from when the customer places their order to when they receive their order. As the world’s largest fulfillment company, it’s hard to beat Amazon on fulfillment speed. So, the best way to ensure the fastest possible shipping speed is to sell through the Fulfilled by Amazon, or FBA, program. Of course, this is not a simple decision. There are many fees to think through and consider. But, if fulfillment speed is one of your main challenges within your own warehouse or with your fulfillment partner, you might consider selling at least a portion of your stock through FBA. Healthy customer service metrics (aka Account Health Metrics) are one of the key factors in winning the Buy Box. Late shipment rate is one of the most critical metrics that indicates good or poor account health. Late shipment rate measures the percentage of shipments that customers receive later than the expected delivery date. Amazon sets a low late shipment target of 4%. If your late shipments are consistently over that target for an extended period of time, you could risk having your account deactivated or suspended. Late shipment rate also impacts your Buy Box percentage. Your goal should be to keep that percentage well under Amazon’s target to have the best chance at winning the Buy Box. For more on late shipment rate and account deactivation and suspension, take a look at our Account Suspension video. To help ensure timely shipments, another strategy you can use is to prioritize all Amazon orders in your fulfillment center over other customer orders. 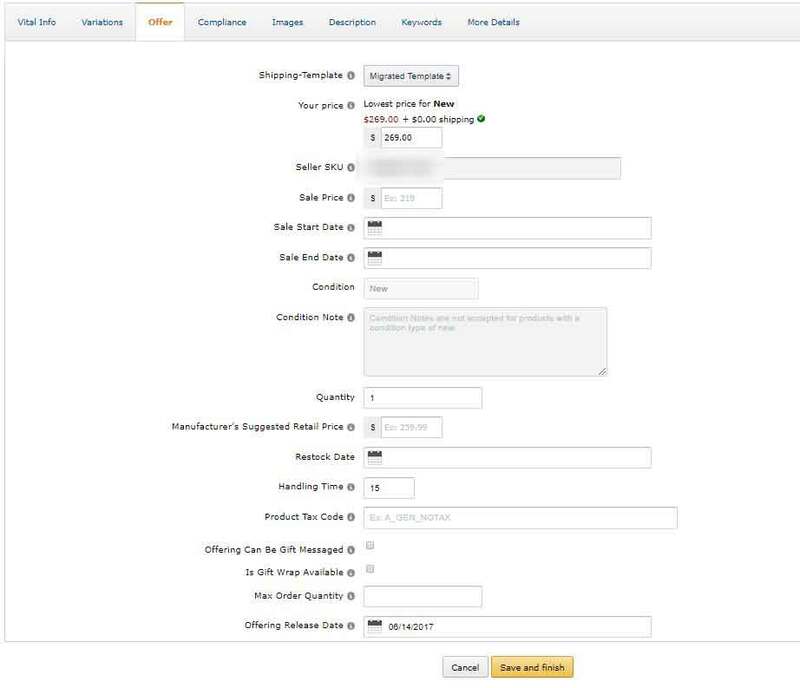 This may require a special tagging system in your ordering and warehouse systems, but if your warehouse or fulfillment center has any hiccups or bottlenecks, this will help ensure that the Amazon orders will get out ASAP and keep that late shipment metric as low as possible. By default, Amazon sets your handling time to 2 days. Ideally, you want to optimize your fulfillment so that you can stay within that 2-day handling time. Your handling time setting factors into the expected delivery date, so if you are not able to achieve that 2-day handling time, then you will see your late shipment rate increasing, which will be a knock against your customer service metrics, and therefore, your chances of winning the Buy Box. If you’re having a hard time fulfilling in 2 days, evaluate how much time you need and then change your handling time setting accordingly, so that your shipments are on time and your customer service metrics stay healthy. Additionally, if your handling time is less than 2 days and you can consistently achieve a shorter handling time, update your setting to 1 day. A shorter handling time will improve your fulfillment speed and give you an advantage over other sellers for winning the Buy Box. You can find the handling time setting on the Offer page in Seller Central. Always have at least 15 days worth of inventory in stock. Amazon’s concern when stock gets too low is that the customer will have a poor experience if stock runs out and their order can’t be fulfilled. If you’re shipping your own products out of your fulfillment center, knowing your inventory run rate will be key. You can calculate your inventory run rate by dividing the units sold in the past 30 days by 30. This will give you an understanding of how many products you sell per day. Then, multiply that number by 15 to see what your minimum inventory should be. Keeping 15 days’ worth of stock available will put you in the best possible standings to win the Buy Box. If you’re already running products in FBA, check your FBA Restock Report daily! This report is in the Reports section under Amazon Fulfillment Reports, and shows how many days of stock you have available for each FBA SKU based upon the inventory run rate. This report will also give you a recommended quantity to ship for each SKU and a recommended date for when to ship it to FBA. Just make sure to double check your inventory numbers against Amazon’s for accuracy. You’ll also want to make adjustments for seasonal changes, for example, if you are entering or exiting a peak holiday buying season or sale. Keep in mind that if you don’t sell through that inventory, you’re going to be paying more to Amazon in FBA monthly storage fees. Your customer reviews are another important factor in your customer service metrics. If you’re just getting started, you can take advantage of Amazon’s new(ish) early reviewer program. In the early reviewer program, you’ll pay Amazon $60 to help you secure your first 5 customer reviews. Another excellent way to increase customer reviews is to insert a flyer or postcard into your product box asking the customer to review the product. For more ideas on increasing customer reviews, watch our Amazon Customer Reviews video. The last important Buy Box factor is your seller rating. These aren’t reviews on your products, but rather on how satisfied customers are with you as a seller. The better and higher amount of seller feedback you have on your account, the higher positive effect it will have on your Buy Box percentage. You can see your seller rating in the Performance Tab under Account Health and under Customer Feedback. You’ll see your feedback star rating for the past 12 months along with the most recent submissions. Amazon will also give you feedback trends for 30 day, 90 day, 365 day, and lifetime periods. If you’re wanting to improve your seller feedback, the best way we’ve found is through email drip campaigns. An email drip campaign is a marketing strategy that automatically “drips” relevant emails to customers after their purchase. The best practice to get more seller feedback is to send an email one to two days after delivery to the client. This is a long-term strategy that won’t get you thousands of reviews overnight, but will help you consistently get more feedback over time. Amazon will favor Prime products since the shipping is usually free, fast, and the best customer experience. The Buy Box algorithm will give preference to products with the Prime badge. The most common way to become Prime eligible is to sell through FBA, but FBA isn’t a good fit for your business, you can also enroll in the Seller Fulfilled Prime program. This tactic is specifically useful if you’ve had a recent run of poor account health metrics, such as a high late shipment rate or order defect rate. Assuming you’ve fixed the issues with your shipping or products, or whatever was causing the poor health, the idea here is to run an aggressive advertising campaign so that you can temporarily boost sales and quickly dilute the poor health metrics on your account. A quick and easy way to get started with Amazon advertising, is to set up a Sponsored Product Auto campaign, which automatically targets the most relevant keywords that customer are searching to find your product. Sponsored Product Ads will show up in both the Amazon search results and on other sellers product pages and you’ll be able to see what kinds of keywords people are using to find and purchase your product. From there, you can take your best performing keywords and set up Sponsored Product manual campaigns. Amazon’s Buy Box algorithm is a mysterious black box, but understanding the known key influencers and implementing some of these best practices, you’ll be able to increase your Buy Box percentage and see your Amazon business grow.